Mahmoud Abbas isn’t responsible for rising violence: Benjamin Netanyahu and American conservatives blame Palestinians out of ideology, fundraising, and bigotry. There’s no excuse for recent attacks. But it shouldn’t shock anyone that Israel’s harsh occupation and abuse provokes Palestinians. 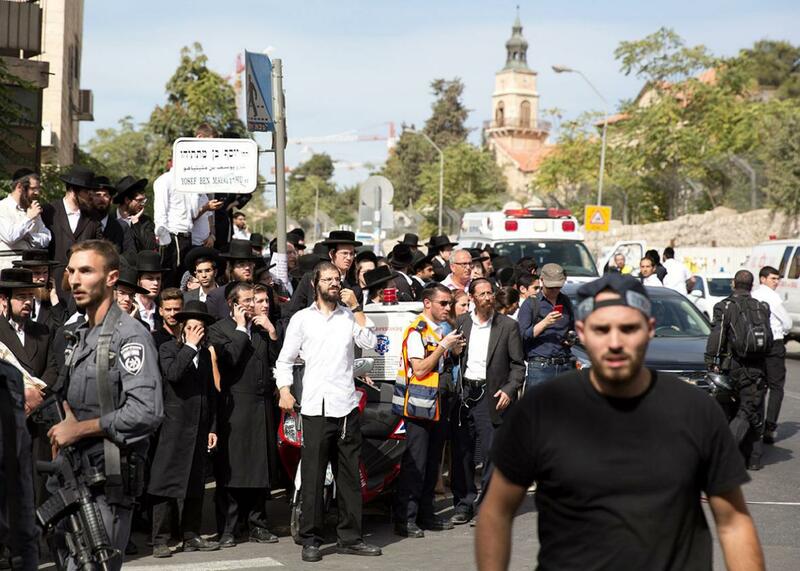 Ultra-Orthodox Jews gather at the site where a Palestinian man drove into a bus stop and carried out a stabbing attack in Jerusalem on Oct. 13, 2015. Photo by Menahem Kahana/AFP/Getty Images. The tragic upsurge in violence in Israel and Palestine over the past two months, which began with the August murder of a Palestinian family by Jewish settlers, followed by clashes on the Temple Mount and Noble Sanctuary, and over the past several days by a spate of horrific attacks by Palestinians against Israeli civilians, has been accompanied by the usual accusations and counter-accusations from politicians and pundits. It’s worth examining these claims for a moment to see what they tell us about the current moment, and why it’s likely to recur as long as the occupation continues. According to an assessment last week by the Israel Defense Forces intelligence directorate, however, Abbas has been taking responsibility—and fighting terror. The IDF also reported that, despite Abbas’ speech at the United Nations late last month threatening to withdraw from agreements with Israel, the close security cooperation between Palestinian and Israeli security forces in the West Bank has continued. As for Netanyahu’s claim that Abbas was lying about the Temple Mount, it’s worth noting that Abbas is far from the only one unclear on Israel’s intentions. The Jerusalem Post reported, “But pressed on the matter, State Department officials echoed Abbas’ concerns, suggesting they believe Israel’s policy leaves open the possibility of change at the site.” This is probably because members of Netanyahu’s own Cabinet have been quite open about their goal of changing the status quo at the site. Under Abbas, the Palestinian Authority has delivered years of security to Israelis, something acknowledged across the board by U.S. and Israeli officials. The understanding, affirmed in the Bush administration’s 2002 Road Map, was that if the Palestinian leadership worked to control terrorism and manage security, it would receive more independence, leading to full autonomy and statehood. But it hasn’t worked out that way. Especially since Netanyahu took power in 2009, the Israeli government has taken advantage of the relatively calm situation (for Israelis) in the West Bank to dramatically increase its control of key areas, including Palestinian areas of Jerusalem and the Jordan Valley, in ways intentionally designed to foreclose the option of a viable Palestinian state. In return for security, the Palestinians have received more occupation and more settlements. And now that violence is on the upswing, they’ll probably receive more occupation and more settlements. In an op-ed he co-authored, former Shin Bet chief Ami Ayalon wrote, “Israelis will have security when Palestinians have hope.” Recognizing the direct connection between despair and violence isn’t excusing that violence; it’s just common sense. But unfortunately, for reasons of ideology, fundraising, or bigotry, it’s common sense that too many politicians and pundits lack.